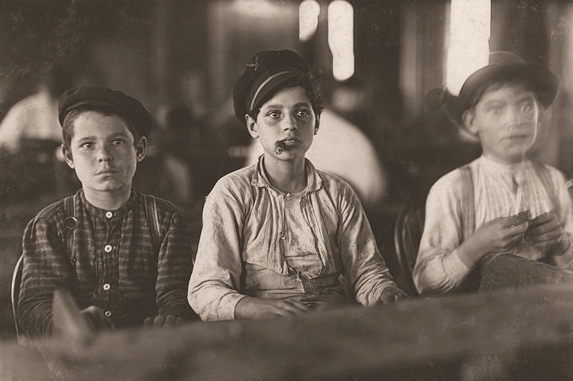 Lewis Hine photographed children all over the country in the early 1900s. Although he focused on larger cities, in 1916 and 1917 he photographed child laborers in the new state of Oklahoma. Oklahoma's child workers were different for two reasons. First, the state had stricter laws than the federal government when it came to child labor, although they still allowed children under eighteen to work up to ten hours a day! Second, many of the children who worked in Oklahoma were often not in factories like other states and larger cities but worked as farm hands and labored alongside their parents. Hine photographed child laborers in Tulsa, Oklahoma City, Lawton, Shawnee, Okmulgee, Sulphur, and other smaller communities in the state. His documentary style of work brought the horrors of child labor in the United States and the responsibility of citizens to the forefront of American thought. Because of Lewis Hine's work through the National Child Labor Committee, President Franklin D. Roosevelt signed the Fair Labor Standards Act in 1938.